The Christmas Tree Festival held at St Paul’s, displayed a wonderful array of trees decorated by church and community groups, each one very unique. As well as the trees there were singers and musicians who made music to entertain visitors and add to the Christmas spirit throughout the week. Charities supported by this event were the East Dunbartonshire Women’s Aid Project, the Milngavie Youth Centre and Glasgow Street Pastors who provide assistance to people on our city streets on Friday and Saturday nights. Along with other Milngavie churches, St Andrew’s helped with organising the event. 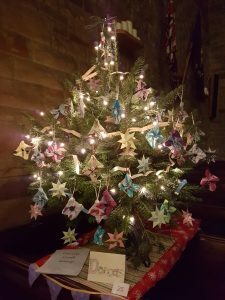 Our Dorcas craft group decorated a tree, complete with beautiful fabric flowers, origami stars, tape measure garlands and all topped with a pair of foil scissors!